With broken hearts we announce the sudden passing of James Murray Thomas at his home on January 26th., 2019, in his 75th year. Predeceased by his parents, George and Jessie Thomas of Waterdown. He is lovingly remembered by his sister Janet (Filip) Dorin, brothers David and Ted. Beloved uncle of Jennifer Dorin, Jeff Dorin (Tammy Schmidt), Mary Beth Dorin, Sarah Dorin McSweeney, Dustin Thomas, Katelyn (Jason) Loykowski, and Cheryl Colucci. Jim was a beloved Great Uncle to Brent and Ayden Dorin, Maya and Kiera McSweeney, Maddison Martin, Elinore Schmidt, Grace and Janine Loykowski. He will be mourned by many others in his extended family. Jim was a graduate of Sheridan College in Social Work. He worked for Halton-Peel Children's Aid Society for many years, and more than 25 years at Griffin Centre in North York. Jim was the owner/Director of All Ontario Scouting Services. He travelled Ontario scouting high school basketball players. He published a bi-annual All Ontario Scouting Report. He wrote a basketball column for the Toronto Sun and a basketball blog called In the Paint. Basketball was his passion and he was well known throughout the basketball community. He was honoured by McMaster University for his contributions to their Marauders basketball team. Jim was also an avid cyclist, cross country skier, and hiker. 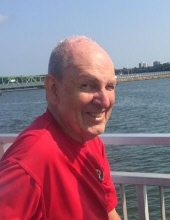 He was a long-time member of the Toronto Bicycling Club and the High Park Hiking and Skiing Club. Jim loved to travel and visited many places around the globe. He travelled throughout the British Isles, Europe, cycled New Zealand, Australia, and the Alberta Ice Fields. He went to many of the islands in the Caribbean and skied all over Ontario, Quebec, and in the USA. "Email Address" would like to share the life celebration of James Murray Thomas. Click on the "link" to go to share a favorite memory or leave a condolence message for the family.